When nursing home employees are overworked or stressed, it may cause them to lash out at the residents they care for. Lashing out can entail hitting, kicking, biting, or causing residents to fall. Accordingly, if you see a bruise or a laceration that you have never seen before or your loved one has suffered a “fall” even though he or she has no prior history of being a fall risk, it may be a sign that your loved one is being abused by nursing home staff. Along with unexplained or abnormal physical injuries, if a nursing home resident is dehydrated or malnourished, this may be a sign that he or she is being abused. 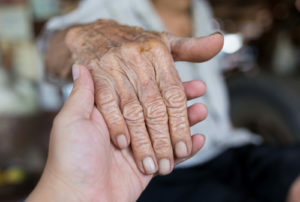 Given their advanced age and medical conditions, some nursing home residents may have conditions where they are more prone to become dehydrated or malnourished. If this is the case, the fact that the residents are either dehydrated or malnourished may not be due to nursing home abuse. However, in other instances, nursing home staff may intentionally withhold food and water from residents as a disciplinary tactic or, due to understaffing or improper training, staff may simply forget to give food and water to their residents. If either of these situations occurs, it is likely nursing home abuse. Sudden weight loss, sunken and dehydrated skin, and lack of energy are all signs that a person is dehydrated or malnourished. Nursing homes are required by state and federal law to maintain cleanly conditions for their residents. If they do not, then this may be a sign of nursing home abuse. Nursing home staff generally have a duty to ensure that their residents are properly groomed. Accordingly, if you observe that your loved one’s hair is uncombed or it appears as though he or she has not bathed or brushed his or her teeth lately, these may be signs of nursing home abuse. Sometimes, nursing home residents need assistance moving or they are completely immobile. If this is the case, then nursing staff have a duty to ensure that residents are moved every couple of hours so as to prevent the development of bedsores on the resident’s body. Consequently, if a resident does develop bedsores, this may be a sign of abuse. While mobility generally decreases as people age, nursing home owe residents a duty to help them stay reasonably active. Accordingly, if you notice that your loved one has a sudden unexplained decrease in mobility or is suddenly becomes completely immobile, this might be a sign of abuse. In order to become a resident at some nursing homes, the nursing homes require that you provide them financial account information so that they may bill the resident for their services. In this situation, nursing home staff may try to discreetly pocket some of the resident’s money by either making small, but frequent expenditures for their own benefit or may simply steal small amounts of money from the resident. Consequently, if you have access to a loved one’s financial statements and notice unexplained purchases or withdrawals, this may be a warning sign that someone employed at the nursing home is financially abusing your loved one. Sometimes, nursing home staff may be cruel to nursing home residents by saying hurtful things to them or by giving them the silent treatment. If either occurs, it has the potential to cause the resident to experience sudden changes in his or her personality and become fearful, agitated, withdrawn, or sullen. If you notice a sudden shift in your loved one’s mood while placed in a nursing home, it may be because they are being psychologically abused by staff. While no one wants to think about their elderly loved ones being sexually abused while in a nursing home, unfortunately, this does occur. Accordingly, if residents do have unexplained bruises on their genital region or suddenly contract and STD or other genital infection, it is likely because they are being sexually abused at the nursing home. While nursing home residents may suffer from greater confusion simply because they are aging and/or developing Alzheimer’s disease or dementia, it can also occur if nursing home residents are being over-sedated. If this occurs, it may be because nursing home staff are intentionally administering residents more sedatives than are necessary so that they have an “easier time” in caring for the residents. If the latter reasoning is true, then greater confusion would be a sure sign of nursing home abuse. Seniors in nursing homes and other care facilities deserve to be treated with respect and dignity. Additionally, nursing home staff needs to ensure that patients are safe and secure at all times. If your loved one suffered an injury, or worse, due to nursing home negligence or abuse in New Jersey, you need to speak with a qualified attorney. The experienced nursing home neglect attorneys at Rudnick, Addonizio, Pappa & Casazza PC represent clients throughout New Jersey, including East Brunswick, Manalapan, Middletown, and Edison. Contact us by calling (866) 567-0135 or fill out the online contact form to schedule a free consultation today. We have an office conveniently located at 197 State Route 18 South, Suite 3000, East Brunswick, NJ 08816, as well as an office in Hazlet, NJ.